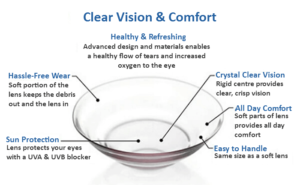 Kerasoft lenses are tailor made soft lenses designed for high/complex prescriptions and irregular shaped corneas. Kerasoft lenses have transformed the lives of Keratoconus sufferers and long time wearers of hard rigid or gas permeable lenses. Sufferers of Keratoconus progress from glasses to various types of contact lenses and eventually have no other option but to wear rigid or gas permeable lenses after other visual aids become unusable. These lenses restrict oxygen entering the eye and can be difficult to tolerate. They do not allow for practical use in certain environments or for extended periods of time, meaning that for the rest of the day the sufferer’s sight is impaired. Lynn White worked with Bausch and Lomb to help develop Kerasoft lenses by designing a soft lens that is able to provide comfort and visual acuity for those suffering with irregular corneas. The lens is thin and is made of silicon hydrogel materials consequently eliminating the discomfort of pressing on the cornea and has the structural integrity to not replicate the irregularities of the cornea that cause visual distortions. Kerasoft lenses have been made to allow greater oxygen transmission through the lens than traditional soft contact lenses thus reducing the chance of dryness. This unique design enables patients to wear these lenses comfortably for extended periods of time and return back to a normal life. The Kerasoft lens is a specially designed and fully customisable to fit each individual eye as it uniquely drapes over the cornea. They can be fitted to any cornea and even after surgical procedures. AVC is the only refractive clinic in the UK whose consultants have been personally shown how to fit the lenses by the co-creator, Lynn White (AVC patient) and where Kerasoft fittings and Keratoconus treatments are all done in house. At AVC we understand the difficulties that are caused by visual impairment and are committed to providing our patients with a total visual rehabilitation programme that is conducted all under one roof, making the entire experience more comfortable and convenient. We provide bespoke tailor made lenses that are uniquely designed to correct the visual impairment caused by corneal abnormalities. These versatile lenses are adaptable and can fit all corneal shapes. AVC provide all patients with the best care and results, constantly surpassing expectations. For the convenience of our patients we providing fitting services to create your perfect lens and show you how to insert and remove them. Advanced Vision Care’s Medical Director and lead surgeon, Dr CT Pillai, is one of the few surgeons in the country that has both a corneal and refractive fellowship. He has over 25 years of experience as an ophthalmic surgeon and his expertise in the field of corneal abnormalities is highly sought after.